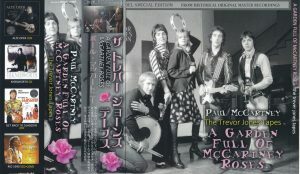 This film is a collection of tapes released around 2010, owned by a person named Trevor Jones who worked for Paul’s Lodi. At the time from M Claudel label, what was released as Vol. 1 and Vol. 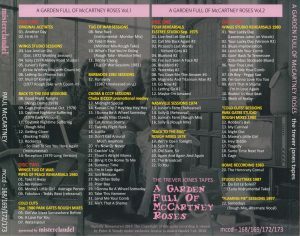 2 of “A GARDEN FULL OF McCARTNEY ROSES” is a reappearance that made both of them into a four-disc set along with the discontinuation. 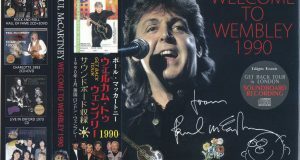 It is not only the first appearance sound source collection that recorded the rare tracks from the Wings period to the late 80’s, but the content is also full of attractive attraction, and all materials are first appearance in such an amount It was like Bon and New Year came at once. First, Disc 1 contains material from “Another Day” which became the first solo single of Wings era, to the album “Back To The Egg”. The “Another Day” and “Hi Hi Hi” are sound sources from acetate. The following “Live And Let Die” is a surprise studio outtake. Paul’s vocals have never been heard before, and they are a simple version of only the keyboard and drums without an orchestra. The middle reggae-like part is unfinished, Linda screams and the song ends up being a gudagda. And although it was once over, Paul gives instructions to do what to do with this part and tries again, but after all the melody does not come to suddenly suddenly, and it ends after all as it is. “Soily” is an outtake of “One Hand Clapping”. It is such a terrifying performance that the performance of the later World Tour feels so slick. 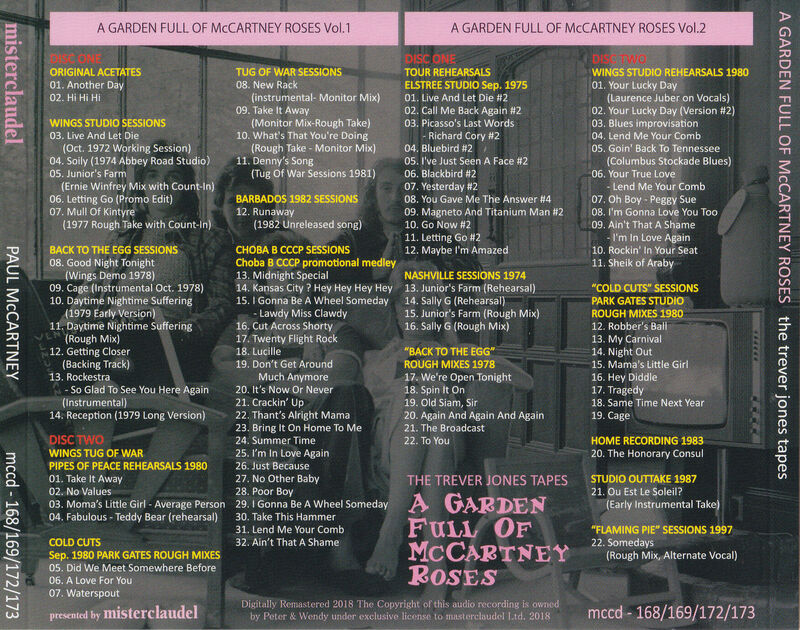 The remix sound source of “Junior’s Farm” and the rough mix of “Mull Of Kintyre” each count the original. The second half of Disc 1 collects sound sources related to “Back To The Egg”. I am surprised only by the first appearance sound source which I did not listen to disk 2 even more ugly. First, from the Wings’ Tug Of War session, the studio outtake of Take It Away. This is also very lively, perhaps in the beginning of the session, and it is clearly recorded how Paul gives instructions to band members while playing himself. Furthermore, from this session, Wings version of “No Values” included in the movie “Broadstreet”. You can enjoy the ad lib of Paul not in the release version in the middle part. Furthermore, after the rough mix of “COLD CUTS”, the resuming session after becoming a solo of “Tug Of War” session that was crawling in Wings. The “Take It Away” here is quite complete. “What’s That You’re Doing” with Stevie Wonder is an endless jam-like performance. The last half of the first half is the promotion medley of “CHOBA B CCCP,” released in 1988 only in the USSR, and later released worldwide. All are short recordings, and introduce the album in a medley format. However, while saying to introduce the album, its contents can not be overlooked because it is a rare item including songs not recorded in the album. Notable songs not on the album are “Cut Across Shorty”, “It’s Now Or Never” recorded on the tribute later, and “No Other Baby” recorded on “Run Devil Run” 10 years later. I am also recording at this time. It is known that the sound check was played in 1993, but it was recorded in anticipation of recording at this point. The following “Poor Boy” and “Take This Hammer” are songs not recorded in the album. Furthermore, “Lend Me Your Comb” which was playing in BBC session in the Beatles era. The intro’s jazzy riff is so cool and it sounds like the Beatles. And the last is “Ain’t That A Shame” which is also included in the album, but it is another take with a completely different vocal. Paul’s ad lib bursts, and in contrast to the neat and tight take of the release version, it’s a terrific take that breaks into a mess and sings. Disc 3 is the sound source from the tour rehearsals held in September 1975. Almost one stage has flowed out with the title “1975 STUDIO TOUR REHEARSALS” from the same label, but the one included in this work is the sound source that should be called the outtake that was not recorded there, and of course the sound board is included. 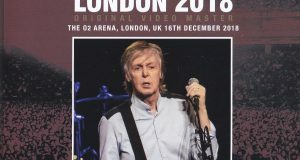 When the tour is about to start, it is a lively performance even in a peaceful atmosphere, especially when it comes to Paul’s singing, as if to find out which part to make Kobushi sing. It is impressive to sing while changing. A session sound source recorded in Nashville in 1974. First of all, two songs from the studio rehearsal, “Junior’s Farm” is a version without playing vocals and only playing, you can hear Jimmy’s intense guitar clearly. “Sally G” is a version that starts over again after an intro failure. The second half of the song is a rough mix of “Junio’s Farm”, which begins with the call to the staff, and “Sally G,” which also begins with the count. And the last of disk 1 is a rough mix related to 1978 “BACK TO THE EGG”. Disc 4 is also full of interesting sound sources. The beginning is rehearsal sound source in the studio performed in 1980. 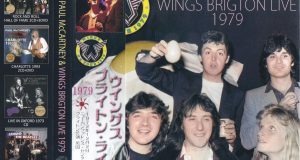 It is not clear under what circumstances this was recorded, but it is credited in 1980 and it is the name of Wings, so it will be the ones coming and going soon after the new year. “Your Lucky Day” by Laurence Juber’s vocals, which could not be heard in the Wings era, is a melodic and good song. With an improvisation, “Lend Me Your Comb” is familiar in the Beatles era of performances. Whether it is a very favorite song, it is known from the sound source recorded on Disc 2 that recording was attempted even in the session of “CHOBA B CCCP” after this. Besides, I wonder if “Your True Love” has begun to play, and it has become “Lend Me Your Comb” again, Buddy Holly’s “Oh Boy”, “Peggy Sue”, “Ain’t That A Shame” Such as “I’m In Love Again”, and “Sheik Of Araby” recorded in Decca Audition, it seems that the session in this Wings seems to have come to fruition as a rock and roll album several years later. In the second half of the disc 4, first of all, eight rough mixes of “COLD CUTS” are recorded. You can see the difference between “Robber ’s Ball,” where the intro has a studio chat, etc., but other than that, it is the first appearance, but there is not much difference with the existing take. The last three songs are the demo sound source of “The Honorary Consul” first recorded in 1983. It was written as a theme song for a movie of the same name, and the movie itself is unreleased in Japan, so it is a fairly minor number among the poles that people know. The 1987 instrumental version of “Where is the sun?” Is a mix that emphasizes the rhythm track. The last is a rough mix of “Somedays” from the 1997 “Flaming Pie” session. Vocal is a separate take from the release version. A collection of sound sources that flowed from Trevor Jones, which was Roddy of Paul, is set again with Vol.1 and Vol.2 set. A permanent press with beautiful picture and disc specifications. Japanese band included.